Our day combines formal adult-led activities and Child Initiated play. Children often return home from their day at school and when asked what they have been doing they say, “I just played”. In reality, from their first few days at school the children will be learning through a play-based curriculum. Our day, after Collective Worship, starts with a mathematics lesson. After a short input, where I will introduce a new skill or concept, the children will be offered a range of activities which will be centered around this topic. During this time, the children will be called to work individually or in a small group with me or Mrs Lightfoot on a small written/focused task. This will be repeated, after playtime, with an English lesson along the same structure. The children, during their week will have discrete lessons in PE, ICT and RE. We also invite the Year 1 children into our class for 2 afternoons each week and we use this time to study a ‘Creative Learning’ topic, details of which are published on our class webpage each term. Some of the most important times in our day happen when the children are given the opportunity for ‘Child Initiated’ (free) play. This is when the children engage in an activity by choice using the resources that are available, or when a child takes ownership of an activity that we have provided by changing its focus. Here, we see the children’s new knowledge being integrated into their play and they begin to fully understand and consolidate the concepts we have introduced in class. We try to capitalise on these interests by providing further resources, challenging conversation and by engaging in the activity with the children to observe and assess the learning that is taking place. If you'd like to find out more about the National Curriculum, you can visit the official National Curriculum website by clicking here. 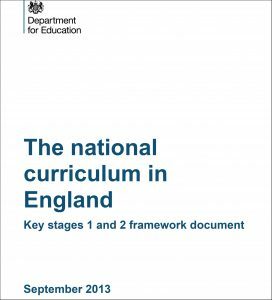 Alternatively, your child's classroom teacher will always answer any questions that you have, or you can click on the image to download the Department of Education's National Curriculum Framework document.